An engaged and productive workforce is built on positive experiences at work. Allowing your people’s voices to be heard and using their feedback unlock a path to a better overall employee experience – and that means an improved culture, reduced staff turnover, and increased quality and performance. Confirmit provides a holistic VoE software solution that covers all aspects of the employee experience and equips you with a continuous flow of insight to inform people decisions. Our one-platform solution incorporates touchpoint surveys aligned to the employee lifecycle, pulse surveys for monitoring key moments at work or interactions with the company, and annual census programs focused on engagement, leadership or culture. Most importantly, Confirmit provides access to insightful dashboard reports in real time – that means you can track sentiment as people are recruited, on-boarded, developed, promoted and even as they exit your organization. Feedback data can be integrated with your existing business platforms like HRIS, learning, and performance management to automate data collection and produce reports that deliver more useful analytics. Confirmit’s suite of Voice of the Employee solutions provides consistent insight to help you improve employee experience, better engage your workforce, and deliver on key business objectives. By standardizing your employee feedback initiatives on one centralized platform, you’re able to generate deeper insights about your organization, teams, and people. Most importantly, you’ll be enabled to deploy surveys, access reports, and take action quickly. Today’s workforce expects a company culture that embraces feedback. Join the next generation of workforce surveying by creating a continuous conversation with employees. Move beyond a yearly employee satisfaction survey and start enabling every part of your business to quickly collect the insights they need, when they need them most, through short, easy, and agile surveys tailored to local business needs and tied to your business cycle. Collect feedback in real time and support your Talent Management strategies with relevant data and live analytics. Confirmit supports all types of pulse surveying concepts with a wide range of effective, simple and automated self-service tools. Vital to your strategic view across your business and driving productivity, your annual engagement survey delivers insight on a range of key predictive metrics. Imagine getting results in real time with the ability to build and customize reports as you see fit! The largest and most sophisticated employee engagement programs in the world run on Confirmit solutions. 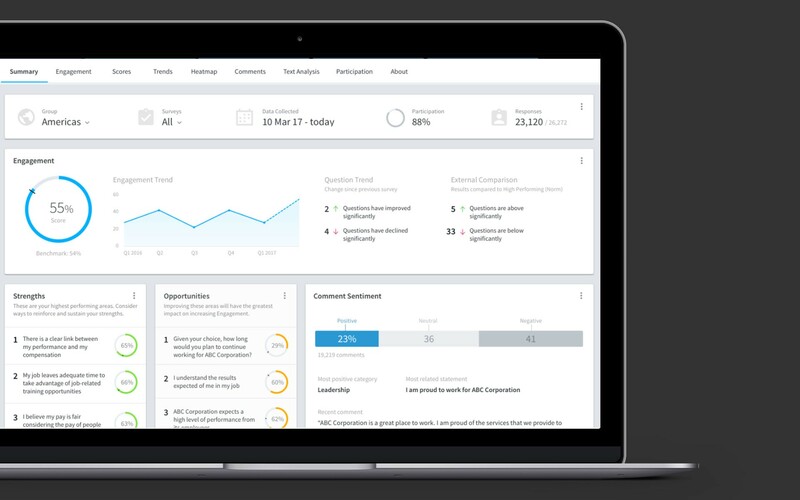 Engagement Providers and corporations alike build their unique engagement programs on Confirmit’s professional grade feedback and analytics platform. Set up listening posts throughout the employee lifecycle to evaluate your most critical HR functions simply, easily and even automatically. Gather feedback on recruitment effectiveness, onboarding and training programs, development and retention initiatives, the exit process, and all the moments that matter in between. Align your Voice of the Customer program with your Voice of the Employee strategy using an Employee Net Promoter Score (eNPS®). 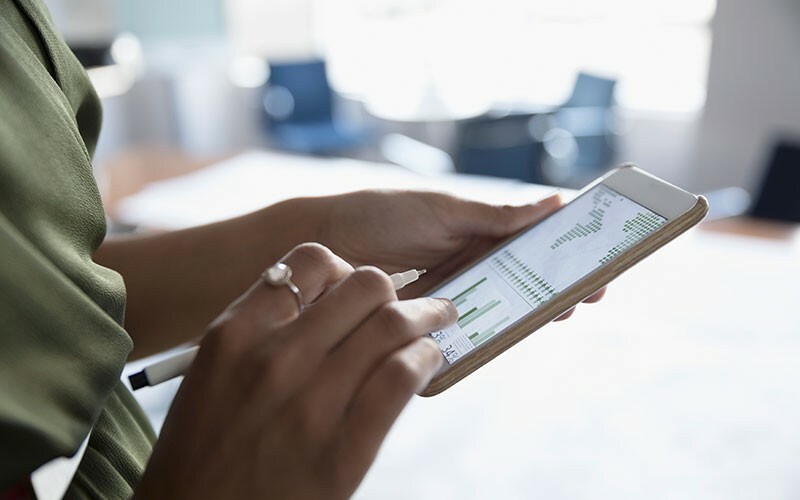 This metric can help you understand the employee experience throughout the entire lifecycle while seamlessly connecting employee experience to customer experience. Confirmit Horizons makes it easy to integrate eNPS® and NPS® programs with all of your business data, across the enterprise. Using deep learning technology, Confirmit Genius draws smarter insights from open comment data in any language. Genius reliably delivers sentiment analytics and automatic comment categorization based on models tailored to your unique business needs. Generate insight about your customers’ experiences and their journeys by soliciting feedback from your employees in a way that aligns with your Voice of the Customer programs. Combining these measures with your organizational metrics allows for advanced predictive analytics about your business performance. Whether they are individual, management, or simply skills assessments, these surveys provide a key mechanism for providing performance and a powerful career development tool. Confirmit's VoE solution provides you the ability to build and run all of your leadership development and assessment programs in one central platform. Ready to find out more about how Confirmit's VoE software can help drive your business forward? We're incredibly proud of our employee feedback solutions and we'd love to show you more. Tell us a bit about your company and we’ll show you how we can help you meet your business objectives today – and in the future. A well-crafted Voice of the Employee program will benefit the entire organization by empowering every employee, at every level, to take action on insights that are tailored to their needs, responsibilities, and situation so that they can get the best out of their teams and themselves. Confirmit's employee engagement software ensures that your VoE program is consistent, with the right level of delivery and frequency, and that it delivers personalized, real-time insights to all of the important levels within your organization. Achieving an accurate view of the entire organization’s people measures, like employee engagement and the drivers of engagement, is a challenge, particularly with teams dispersed around the world. Confirmit is able to help you represent your organization faithfully regardless of how complicated your structures are. You’ll know that you’ll be able to answer key questions for any part of the business. And more importantly, you can leverage real-time data to drive your employee retention strategy through better employee experience and more targeted recruiting strategies. Understand the issues that impact the teams in your region by developing local, tactical Voice of the Employee surveys. You have the control to use standardized surveys shared across the company, or to create tactical feedback programs tailored to your area. However you build your program, you can access the level of insight you need to deliver results. Confirmit’s solutions also allow unique access to HR leaders, and share it with line managers, global leaders, and individual employees. As a line manager, you need to ensure that your people have everything they need to do their jobs effectively, efficiently, and independently. Confirmit enables you to not only get a clear view of the levels of engagement in your team, but also to drill down to understand where your employees need more. Empower your teams by enabling them to provide feedback - confidential feedback when needed - at key events in their time with you, and act fast to keep your people on track and on board. Employees have insight into much more than their own experiences. Use the Voice of the Customer through the Employee to empower your teams to report back on the customer experience. This can capture a deeper level of insight that will enable you to identify key themes and root causes of customer issues, and understand what prevented a contact from becoming a customer. Confirmit’s solutions for 360 feedback enable you to build the most sophisticated company hierarchies. As your company evolves, your 360 degree evaluation program can match your pace, and drive forward your employees and your company. Confirmit's employee engagement software enables you to understand all points within the employee lifecycle so that you can take action at the most critical milestones within an employee’s time with your company. Leading-edge businesses realize the business benefits of linking VoC and VoE, understanding that the way employees think, act, and treat customers reflects the company ethos as a whole, and affects the way customers perceive the brand and the people behind it. Confirmit’s solutions for 360 feedback are built on Confirmit Horizons, so as your company evolves, your 360 program can match your pace. 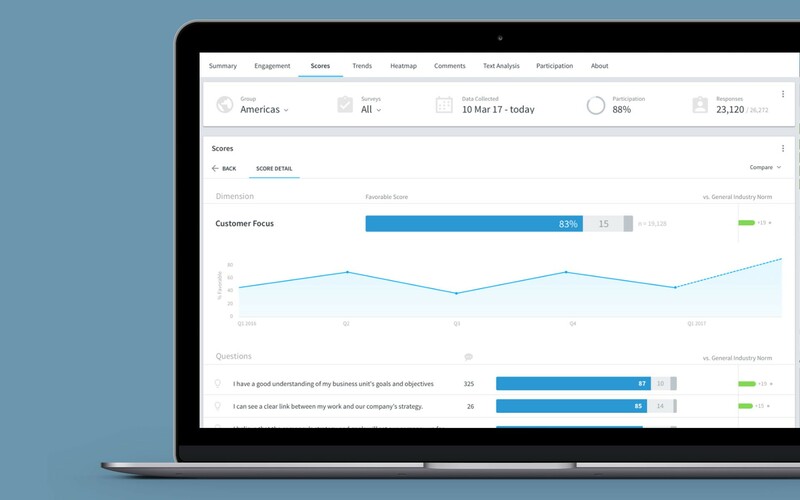 Confirmit Voices is an engagement model that gives you the power to listen to the Voice of the Employee and the Voice of the Customer and integrate that feedback with other business and HR data to generate powerful, actionable insight. You’ll know that the action you take will deliver real business change. 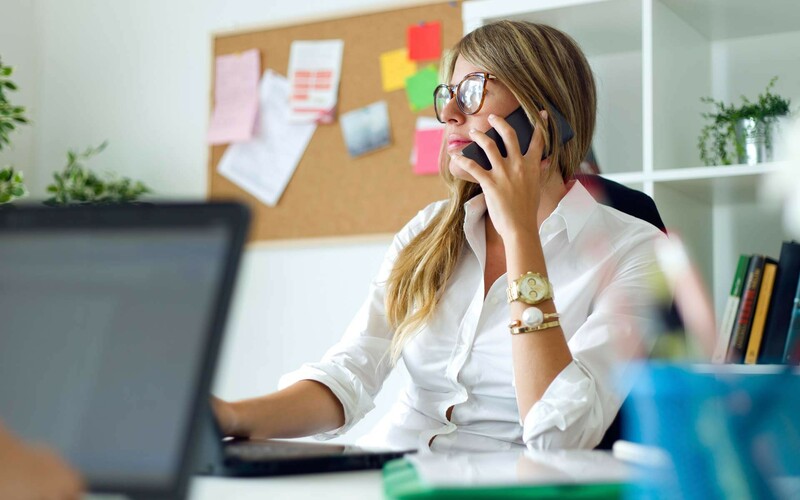 Confirmit Voices uses multi-channel data collection that gives you the power to listen to the voices of employees and customers at the right times. Find out how Confirmit Voices can help you to increase revenue, reduce costs, and drive culture change by engaging your employees. 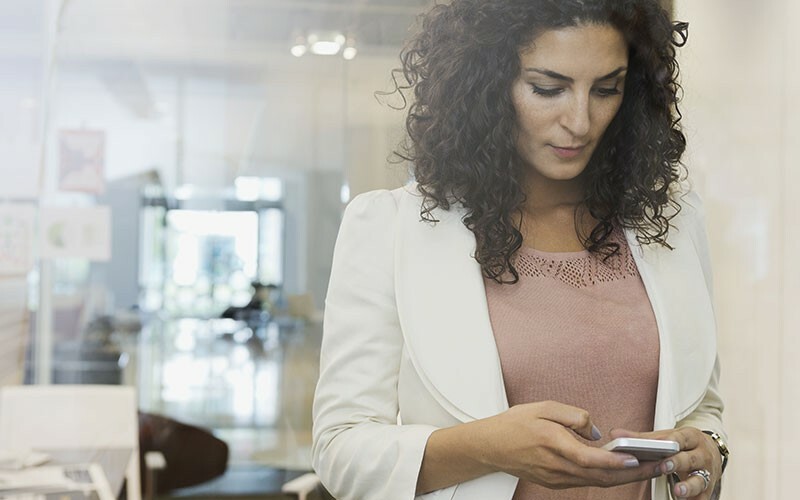 Harness the power to listen to the Voice of the Employee and the Voice of the Customer, and integrate that feedback with other business and HR data to generate powerful, actionable insight. You’ll know that the action you take will deliver real business change. We provide a flexible approach so you can choose the level of involvement that best suits your business. Confirmit will provide you the tools to run your whole process yourself, or use our experts to manage everything for you. We can also complement your capabilities, as you require. If your current VoE activities are spread out across systems and vendors, we can work with you to ensure a smooth transition into a consolidated platform without losing the benefits or advantages of those programs. We provide the ability to build – and adapt to – the most sophisticated company hierarchies. As your company evolves, your programs can match your pace so you can deliver the insight you need now and in the future. Reporting and data analysis is the heart of any Voice of the Customer, Voice of the Employee, and Market Research program. That’s why we provide a comprehensive set of solutions for reporting and analysis. But, we don’t stop there! We understand that reports and analysis are only valuable when insights are shared with the people who can take action at the right time. Beyond reporting and analysis, Confirmit makes sharing data easy with role-specific reports, dashboards, data visualization, and even real-time alerts that can be customized according to the needs of the recipient. 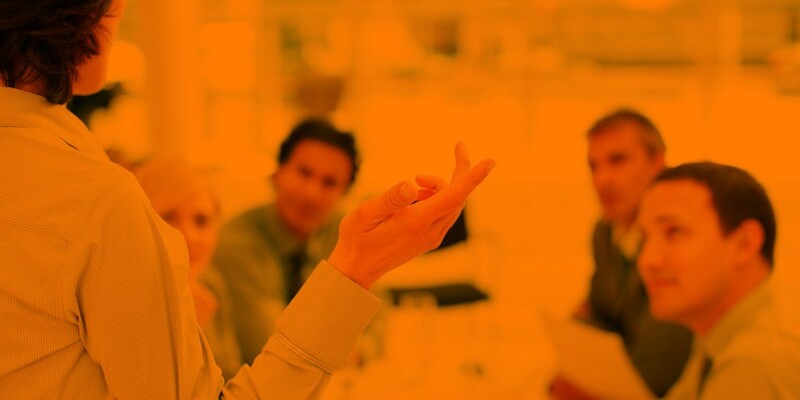 Confirmit can support your employee engagement program, regardless of your company’s size. We create employee feedback solutions for companies of more than 50,000 employees so you’re safe in the knowledge that however your business grows, you won’t outgrow your VoE solution. Run every element of your VoE program from survey creation, to analysis, to sharing results. Integrate data from all your employee engagement and insight initiatives to eliminate silos and consolidate insights that can be turned into action. Make your processes more efficient and maintain control over the program to maximize response rates and quality.